Conceptual Physics: Whar are Miller Indices? The concept of Miller Indices is to describe the various directions and positions of atoms in crystals. Any point within the given Lattice can be considered as origin. 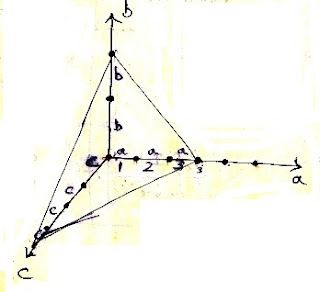 The crystallographic axis a,b&c can be considered as the 3 coordinate axes. So these 3 axes can be selected along 3 crystallographic axes. Consider the plane to be indexed. 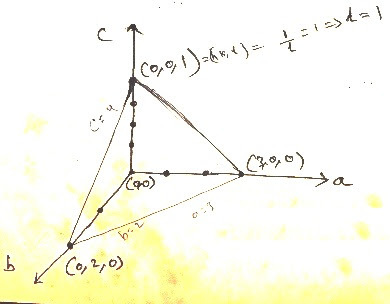 Note down the intercept made by the plane on the three crystallographic axes, intercepted by translation vectors. Let the intercepts be 3a, 2b, 4c, i.e. 3, 2, 4. Find out the Reciprocal of intercepts 1/3, 1/2 & 1/4. Convert them in to a set of integers: 4, 6 & 3. The set of three integers is known as Miller Indices of Plane. 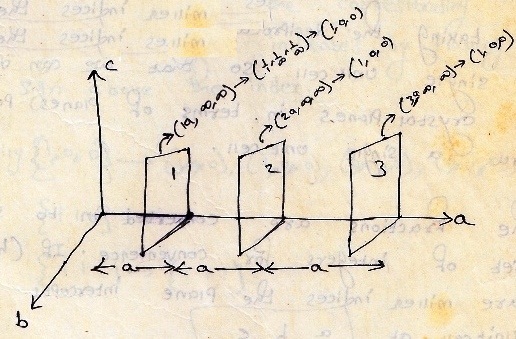 The set of 3 numbers (h,k,l) so obtained are known as Miller Indices and conventionally enclosed in parenthesis. These set of numbers defines the planes and also the family of Planes Parallel to it and equally spaced. It is clear that Planes 1,2 & 3 have intercepts only on the crystallographic axis a. They all are separated by equal distances. The intercept of Plane1 on axis a is at distance ‛a’. Therefore the intercept is (a, ∞,∞). Take the intercepts as (1, ∞,∞). Therefore the Miller indices of Plane 1 are (1,0,0). By taking the Reciprocal of all Planes inside a single unit cell, we can discuss all crystal Planes in terms of Planes passing thru a single Unit cell. If an intercept is at infinity, the plane is parallel to one of coordinate axes, the corresponding index is zero. If a Plane cuts an axis on negative side of origin the corresponding index is negative and is indicated by placing a minus sign above the index. The indices of a direction, are simply the vector components of the directions resolved along each of the coordinate axis and reduced to small integers. In a cubic Unit Cell, if the origin is at the corner and the axes are parallel to the edges, body diagonal would be represented as . A Lattice point n1a+n2b+n3c lies in the direction [n1 n2 n3]. n1, n2 & n3are integers. The use of square brackets around the numbers  denotes that they refer to a crystallographic direction. 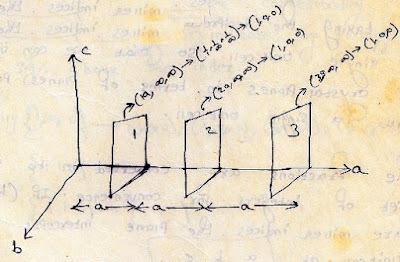 In the same way ‛+a’ axis have indices [1,0,0] and similarly ‛-a’ axis have indices [1,0,0] and for ‛+b’ axis [0,1,0] and ‛-b’ axis [0,1,0]. Positions or points are specified as in any other coordinate system namely by 3 numbers each of which refers to distance along the axis expressed as multiples of Lattice constant.